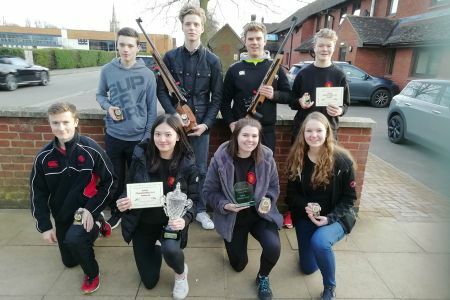 Oakham Shooting has seen impressive results this term with shooters winning the Midlands Schools Cup, students being selected to shoot at a national level and teams reaching the finals in their specific shooting categories. “Oakham’s team of VIII small-bore shooters have won the inaugural Midlands Schools Cup beating Uppingham by a slender margin of 1479 to 1468. The final took place at Howell Rifle Clubs (Nr Asfordby) range under the direction of the Northamptonshire, Leicestershire and Rutland Target Shooting Association (NLRTSA). The team were marginal favourites before the competition until a clash of dates meant that a couple of members including our stalwart captain Alex (Form 7) were unavailable, resulting in a quick team change. Well done also to Form 6 student Varvara who was awarded the Silver Antique Spoon for finishing second place in the Final of the Northamptonshire Leicester and Rutland Target Shooting Association (NLRTSA) Junior Championship. Meanwhile, Oakham’s team of IV small-bore shoots reached the Midland Schools Final undefeated. Oakhamians Angelina (Form 6) and Caspar (Form 7) have also represented England in the British Schools Small-bore Rifle Association (BSSRA) Annual National Shooting Competition. Whilst national selection is nothing new for Caspar, having shot for Germany in the Hunter Field target discipline, it was a first for Angelina. They both shot and scored well for their respective teams with Caspar scoring 194 (ex 200) and Angelina scoring 187 (ex 200). Added to this Caspar shot his way into the final round of the BSSRA individual Championship whilst Angelina was placed 4th in the NLRTSA Junior Championship 2019. Other recent shooting successes include Oakhamians qualifying for the local counties shooting finals and Form 5 student George being selected to shoot for Wales in the British Schools Small-Bore Shooting Association International competition.